Tapered design ensures fit compatibility with most smartphones. For charging and sync. Rugged Construction. Connects to any standard USB port. USB Insertion test: Exceeds 10,000 cycles. Phone side connector has 55lbs. ISimple IS9405. Item Is A 100% Authentic iSimple Product. 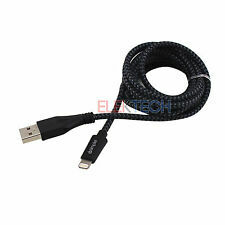 8 pin USB 2.0 cable connects your iPhone, iPad, or iPod with Lightning connector to your computers USB port for syncing and charging or to the USB Power Adapter for convenient charging from a wall outlet. ISimple IS9405. Apple Lightning Connector. Compatible with a computer or USB power port. Standard USB type A connector. Connector strain-relief for extended cable life. Tapered design ensures fit compatibility with most smartphones. Dual layer shielding system. For charging and sync. Rugged Construction. Phone side connector has 55lbs. Connects to any standard USB port. Model Number: IS9615. Manufacturer Part Number IS9615. Product Model IS9615. Manufacturer: PAC. Manufacturer PAC. Item#: 3590552. 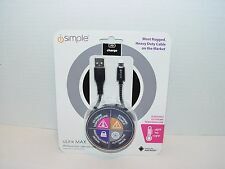 ISimple IS4710BK cigarette lighter USB charging adapter 12V single (2,4A), black. USB charging adapter. After Sales Support Team. That is why it is very important for us to find a solution for every problem. ULinxMAX USB Cable for Micro-USB is built to last, designed and engineered to withstand brutal temperatures throughout the year. The cables have been tested for temperatures as low as -40 degrees Fahrenheit, and as high as 176 degrees. ISimple IS4710BK cigarette lighter USB charging adapter 12V single (2,4A), black. USB charging adapter. Integration Universal. Output power 5V. Voltaje de entrada 12V. Color black. TOP FEATURES AT A GLANCE.